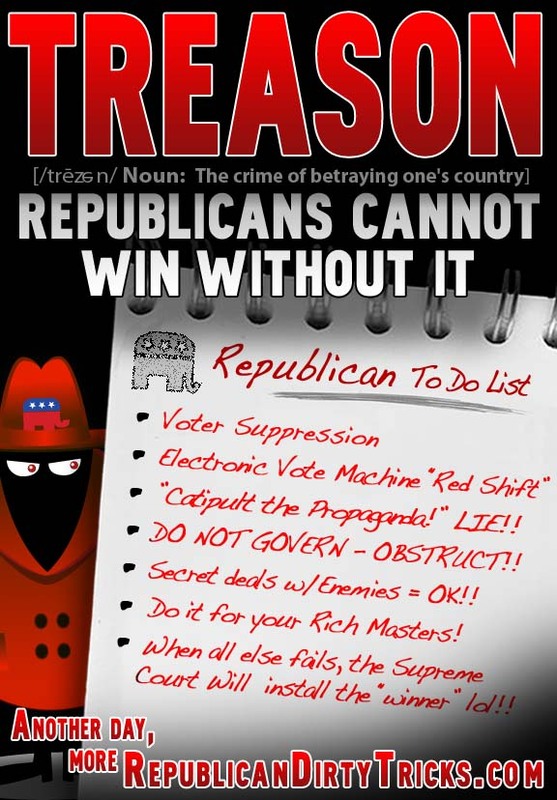 Denis G. Campbell's and Charly James's essay at the Ukprogressive.co.uk, "NSAnalyst Proves GOP Is Stealing Elections," is a frightening harbinger of the 2012 Election. "In states where the winner will be decided by less than 10%, of the vote he already knows he will win. This is no tinfoil hat conspiracy. It’s a maths problem. And mathematics showed changes in actual raw voting data that had no statistical correlation other than programmable computer fraud. This computer fraud resulted in votes being flipped from Democrat to Republican in every federal, senatorial, congressional and gubernatorial election since 2008 (thus far) and in the 2012 primary contests from other Republicans to Mitt Romney. This goes well beyond Romney’s investment control in voting machine maker Hart Intercivic and Diebold’s close ties to George W. Bush. 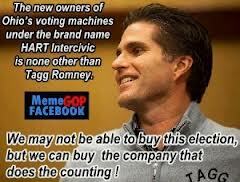 Indeed all five voting machine companies have very strong GOP fundraising ties, yet executives (including the candidate’s son Tagg Romney) insist there is no conflict between massively supporting one party financially whilst controlling the machines that record and count the votes. A retired NSA analyst has spent several sleepless nights applying a simple formula to past election results across Arizona. His results showed across-the-board systemic election fraud on a coordinated and massive scale. But the analysis indicated that this only happens in larger precincts because anomalies in small precincts can be more easily detected. ("There was )...roughly a 10% switch in votes from Democrat to GOP. This was noted in every state except Utah, where the presumption was, as it was Mitt’s religious home state and very conservative, there was no chance of Romney losing and no variance was found." Yes, the amazing thing is that the hacking is not only done by Republican operatives to beat Democratic candidates, but in this case the GOP Establishment candidate Mitt Romney has had the machines fixed to beat the other Republican candidates in the GOP Primaries! 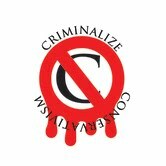 "The results of (the) analysis can only happen if votes are being stolen, and the only way that’s possible is if the computerised machines are programmed to steal them. Welcome to Zimbabwe. "More than 100 million Americans will cast their ballots thinking their vote will be fairly counted. It should be. Yet the crooks know they can safely flip up to 10% of votes without consequence. Anything more than that is statistically suspect. "President Obama won by such a huge margin in 2008 that even with this anomaly built into the system, he cruised to victory. This year the election is much closer. Can American democracy afford yet another election crisis placing three of the four last national Presidential election results in question or worse: The outcome was stolen, the outcome a victim of election theft?" 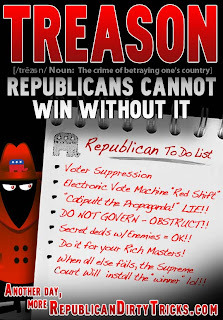 The methodology of the studies is undeniably persuasive - please go to http://www.ukprogressive.co.uk/breaking-retired-nsa-analyst-proves-gop-is-stealing-elections/article20598.html to read the essay from start to finish. 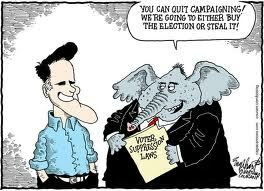 "This isn’t the first time Republicans have been charged with vote theft. It happened in the 2004 presidential election, in Ohio and Florida. "In Ohio, GOP consultant Michael Connell claimed that the vote count computer program he had created for the state had a trap door that shifted Democratic votes to the GOP. "He was subpoenaed as a witness in a lawsuit against then-Secretary of State Ken Blackwell, and lawyers for the plaintiff asked the Dept. of Justice to provide him with security because there were two threats made against Connell’s life by people associated with Karl Rove. But in Dec. 2008, before the trial began, Connell was killed in a plane crash outside Akron Ohio. There were problems in Florida, as well. "A study by the Quantitative Methods Research Team at the University of California at Berkeley found that anomalies between Florida counties using touch-screen voting and those using other methods could not be explained statistically. Noting the higher-than-expected votes for Bush in three large Democratic counties, Miami-Dade, Broward and Palm Beach, Michael Hout, a Berkeley professor who did the study said there were strong suspicions of vote-rigging. "We use paper ballots in the UK and results do not even begin to trickle in until 3 am. The final outcome can take up to three days to finalise. But voters in Britain know the count is accurate because every ballot is transparently hand-counted. When I read this article that Serbia, Belarus and Kazakhstan were sending election monitors to watch the US Election?, I knew we’d jumped the shark. "We are already being victimized by vote fraud on a scale that, in another country, would lead to calls for international election monitors. It is time for Americans to stop being victims of ghosts in the machine." In another country, a Presidential election determined by hacked voting machines or a corrupt Supreme Court would result in rioting in the streets and possibly the crooked politicians being strung up from the nearest lamppost. 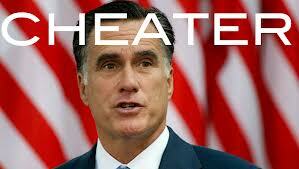 When exit polling proves that Mitt Romney stole the Election, what will your reaction be? The decimation of our right to vote through voting machine hacking, and the intimidation and suppression of voters from the ranks of our minorities, youth, and older voters is a crime. But why do we not go after the conspirators themselves, the front group of the Conservative leadership called the Republican "Party." Why do we insist that this vast criminal conspiracy is protected under the First Amendment when all evidence shows it to be a crime syndicate rivaling all others? secretly wanted to be a writer.